Along California's Central Coast, the fragrant scent of mesquite mingles over a campfire creating a unique smokehouse flavor. Try it on Fajitas; Chicken Beef or Seafood. 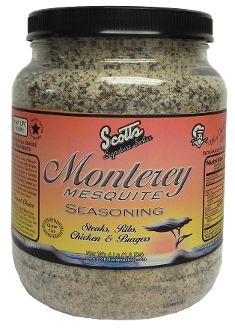 Liven up Steaks or use as a light seasoning on Fish. INGREDIENTS: Sea Salt, Spices, Onion, Garlic, Organic Evaporated Can Juice Crystals, Dextrose, Natural Mesquite Flavor & Silicon Dioxide (for free flowing).